2draw.net - boards - Collaborations - ...... .... .. Very impressive guys, nice team work. Is she holding a game controller? 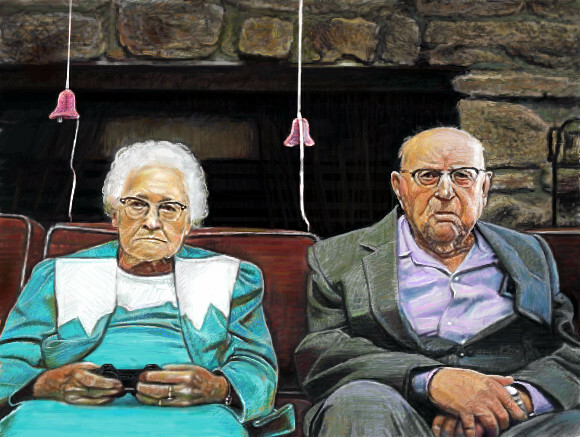 This is really a wonderful portrait of the two oldsters; you guys should consider doing portraits of people together. Yes. If that were me, in the pic, I would love to have a copy of it, lots of people would. Yea it's meant to be a controller, she was holding something else originally. this is fabulous, but, yes, I agree with cyclops on her hands. ps I ADORE the textures of everything! There is nothing like an elderly couple. Wouldn't ya just love to listen to what they have to say here? Outstanding work on this...it is another "wow" drawing. They are so cute...makes me smile looking at them. Good stuff! In my childhood I would never have imagined seeing an old couple playing videogames, but today it's posible! This is the funniest thing I have seen in a long time...it made me smile (not an easy thing, lately, smiling..., it has to be totally worth the effort ;) I think the large hands just add to the....whatever it is about this that cracks me the hell up. Wouldn't change a thing, you two did a great job. I ABSOLUTELY LOVE IT, so glad I stumbled into your gallery and got to view it. Somebody needs to plop this one in the Showcase so no one misses it. hmmm. I dunno. I think the man should have a game controller in his hands, too. It is a masterful piece either way and I agree it should be showcased. So do I, it's amazing work. I'll do a revision on this later dude, then if you're happy we can set it to finished. she says: what's it doing now? he says: you're out of ammo, i told you to swing by ammunation.